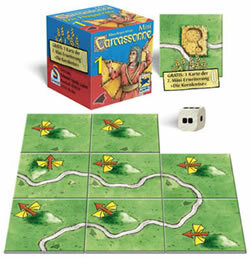 Since its debut in the year 2000, Carcassonne, the classic tile-laying game, has received numerous awards and had many expansions and mini expansions created for it: 40 and counting. 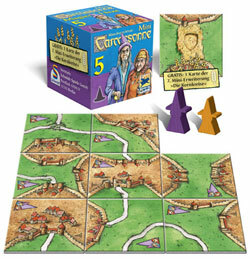 The latest large expansion, #9 Carcassonne: Hills & Sheep, hit shelves July 2014. 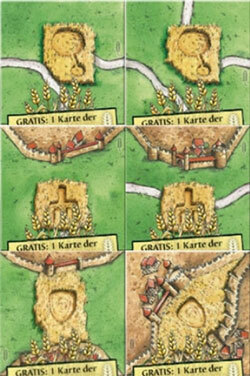 Each expansion adds one or more new tiles and special rules which enhance play and increase replayability. 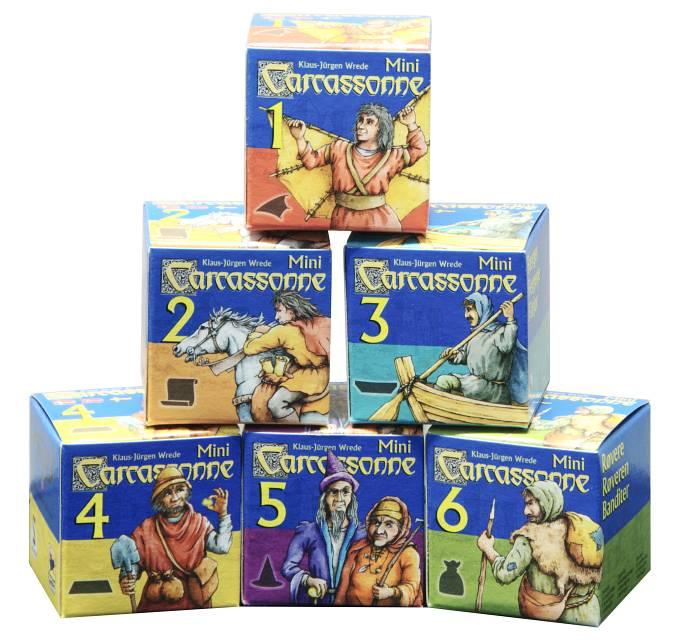 Here’s a quick run-down of the 6 numbered Mini Expansions for Carcassonne – plus the 7th bonus Mini Expansion – and how they affect play. 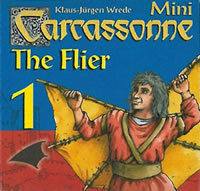 Give your meeples the gift of flight with The Flier! When drawing a tile with a Flying Device, you can either place a meeple normally or roll a die and put it that many spaces away in the direction the device is pointing, into an unfinished building, road, city or cloister (not farm), even if there’s a meeple already there. If there’s no tile at that distance, take the meeple back: you crashed! Contains: 8 landscape tiles with a Flight symbol, 1 die with 1 to 3 pips twice, 1 Crop Circles tile. Score the active player’s shortest road as though it were game end (1 point each). Leave the meeple in place. Score the active player’s smallest city as though it were game end (1 point each). Leave the meeple in place. 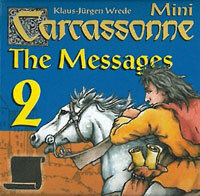 Score the active player’s smallest cloister as though it were game end (1 point each). Leave the meeple in place. Score 2 points for each banner in all cities the active player occupies. He need not have the majority. Score 2 points for each of the active player’s knights. Leave the knights in place. Score 2 points per farmer the active player has in play. Place another tile and (optionally) a follower. Score a follower and retrieve it. 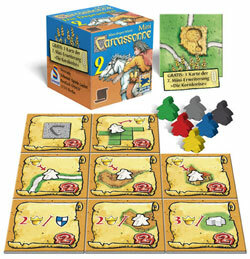 Contains: 8 Message tiles with gold backs, 6 Messenger followers (1 in each of the 6 player colors), 1 Crop Circles tile. Extend your roads with The Ferries. 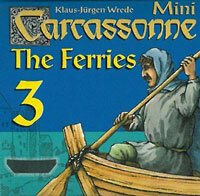 The eight new land tiles in The Ferries each depict three or four road segments leading to a lake in the center of the tile; these tiles are mixed with the other tiles in the game. Whenever you draw one of the lake tiles, place it following the normal rules, decide whether to place a meeple (and if on a road as a robber, on which segment), then place a ferry on the tile to connect two of the road segments. Any segments not connected by a ferry, end at the lake. Whenever you extend a road which has a ferry as a segment – whether by placing a lake tile or a regular road tile – you may move the first ferry closest to that tile, in each direction of the road, to connect different road segments. If this movement leads to a road being closed at both ends, that road scores. You may only place a ferry, when drawing a lake tile. 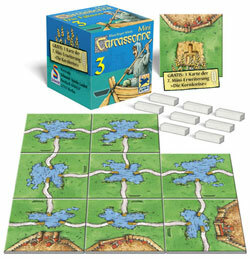 Contains: 8 lake landscape tiles, 8 wooden ferries, 1 Crop Circles tile. 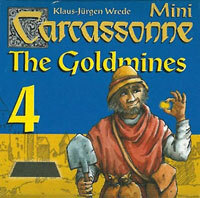 Strike gold in Carcassonne! When playing with The Goldmines mini expansion, whenever you draw a tile with a Gold symbol, place a gold token on it and any one adjacent tile (diagonal or orthogonal). Later, when completing a road, city, or cloister with gold tokens on any part of the feature, the player with the majority of meeples there gets the gold on the tiles making up that feature! If there’s no majority, or more than one feature is completed at the same time, the gold is distributed among the tied players, in turn order, starting with the active player taking 1 gold bar for each feature he scores that has gold bars. At game end, any gold left on the board is removed. Players then score 1 to 4 points for each gold bar, depending on the total number of bars the player collected. If you collected 1 to 2 gold bars, score 1 point per bar; 4 to 6 bars score 2 points per bar; 7 to 9 bars collected score 3 points per bar; and if you manage to collect 10 or more gold bars you score 4 points per bar! Contains: 8 landscape tiles with a gold bar icon, 16 wooden gold bars, 1 Crop Circles tile. 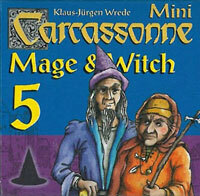 Enchant and Curse incomplete roads or cities with The Mage & Witch mini expansion. In this expansion, whenever you draw a Magic tile (with the Mage/Witch banner), you must move either the Mage or the Witch to an unfinished road or city before placing your own meeple. Note, however, that the Mage and Witch can’t share the same road or city. They’re bitter rivals. When a Mage-occupied road or city is completed, it scores one additional point per tile. A Witch-occupied feature, however, only scores half of its normal score for that feature. Ouch! The Witch is wicked. Contains: 8 magic tiles, 1 witch, 1 wizard, 1 Crop Circles tile. Rob your fellow players for fun and profit with The Robbers. 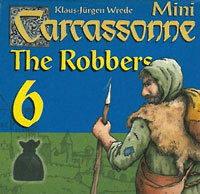 To use this expansion, simply mix the robber tiles with the rest and set the cloaked Robber meeples next to the score board. During play, whenever you draw a Robber tile, you may place your Robber meeple on the score board at the same space as another player’s scoring meeple. The next player in order may then also place or move his own Robber. Once Robbers are on the scoreboard, when a scoring meeple moves from the same space as that of a Robber, that player scores his normal full points, and the owner of the Robber shadowing that scoring meeple, scores half of those points, and takes his Robber back. Thus, you can steal a bunch of freebie points by having your Robber lie in wait next to the right meeple. Well, you don’t actually steal them – the player your Robber shadows doesn’t lose points, you just get to reap some of their score as well. 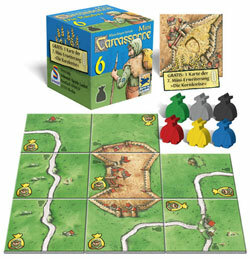 Contains: 8 robber tiles, 1 robber meeple for each player, 1 Crop Circle tile. Aliens abduct one of your meeples or mysteriously return it in Crop Circles II. So you may be wondering what the mysterious Crop Circle tile contained in each of the Carcassonne Mini Expansions 1 to 6 is for. This is it, they form the elusive seventh mini expansion. To play with Crop Circles II, mix the tiles in as usual. When you draw a Crop Circle tile, place it according to the usual rules and carry out your normal turn. After that, however, you have to decide whether to have all players, starting with the player to your left, do Action A or Action B. They all have to do the same thing. Action A: Player may place one of the meeples from her supply next to another of her meeples already on a landscape tile, thus increasing the number of followers she has on a particular feature. Action B: Player must remove one of her meeples from a landscape tile and return it to her supply. The type of follower (meeple) that must be chosen for Action A or B (whichever you chose) is determined by the Crop Circle tile drawn. The Pitchfork Crop Circle affects farmers meeples on a field segment, the Club Crop Circle affects robber meeples on a road segment, and the Shield Crop Circle affects knight meeples on a city segment. When a player performs Action A, she must deploy the follower to a feature which already contains a follower of the same type (farmer to a farmer, robber to a robber, knight to a knight. If a player is unable to perform the action, due to not having a follower of the required type in play, then he passes and the next player to the left continues. The active player performs the action last, and the next player takes her turn as usual. 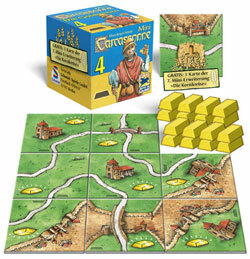 The six tiles of this mini expansion come from Carcassonne Mini Expansions 1 thru 6: one tile from each. Copyright © 2014-2015 by Tina G. McDuffie. All rights reserved.